Posted by Stuart Herbert on September 16th, 2010 in Coal, Historical, Manufacturing, Miscellaneous Sidings And Other Routes, Photos, River Taff, Shoot, Treforest Industrial Estate. 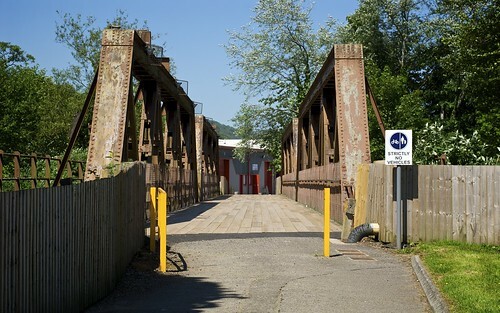 Now a convenient shortcut for anyone using the Treforest Industrial Estate Railway Station on the old Taff Vale Railway line (modern-day Valley Lines service), this bridge used to carry a railway siding south from the Upper Boat Power Station into factories on the industrial estate. I used to think that this was a surviving relic of the old Cardiff Railway, but sadly that just isn’t true; Cardiff Railway remained on the eastern bank of the River Taff (with a station where the Focus DIY store now is at Upper Boat) before finally crossing the Taff over the impressive (but sadly doomed) Rhydefelin Viaduct. 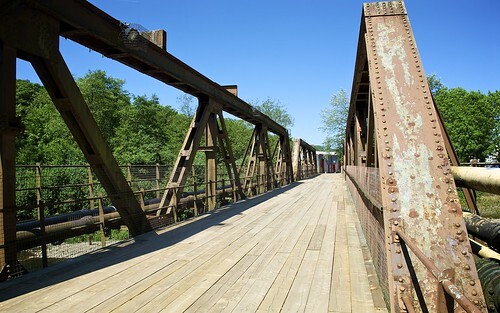 Even so, this bridge is one of the most impressive survivors in the area, and it definitely deserves a feature all of its own. This is how most people see the bridge, as an essential short-cut across the Taff to and from the nearby railway station. If you do find yourself crossing this bridge, I urge you to stop for a few moments to admire it. It is one of the few surviving structures from its time. The railway siding that it carried, and the power station and factories that used to sit at either end of this siding are long gone. As this close-up of the bridge’s structure shows, it could do with a lick of paint to preserve it from the elements for a bit longer. 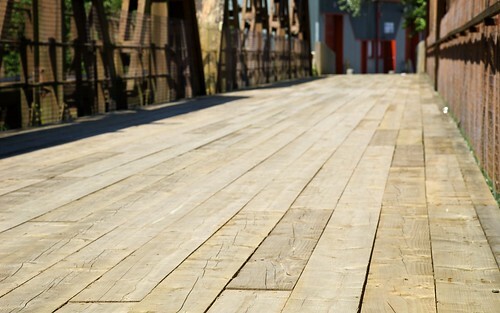 The old trackbed is long gone, replaced by this wooden boarding. Be careful in wet and icy weather; I’ve slipped and slided my way from one end of the bridge to the other on more than one occasion! 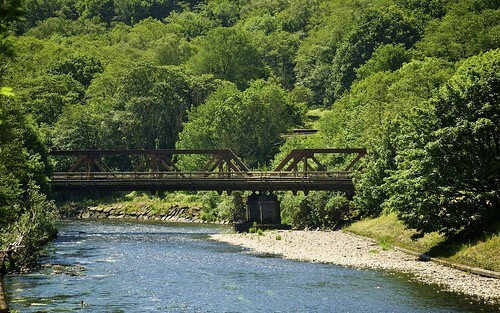 Taken from upstream, looking south west along the River Taff to the bridge. Doesn’t it just look fine? I don’t think you’ll find another one like it anywhere else along the length of the Taff. Posted by Stuart Herbert on July 9th, 2010 in Cardiff, Cardiff Railway, Glamorganshire Canal, Manufacturing, Modern, Photos, Shoot. 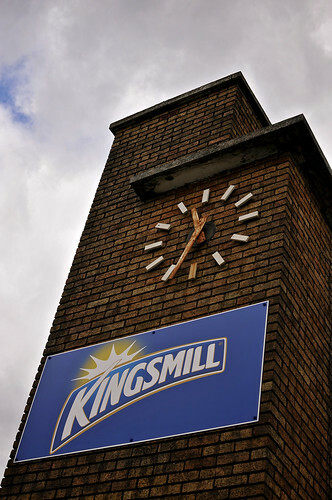 This is the clock outside the Kingsmill bakery on Cardiff’s Maes-y-coed Road. This is the west face of the clock; the east face of the clock is missing. The clock is on the south-east corner of the Kingsmill site; immediately next to the clock is the access road up to Ty Glas railway station, and a Tesco shop (not a superstore, one of the smaller stores that have appeared in the last few years). Copyright (c) 2010 Stuart Herbert. blog | twitter: (photography) (all). Posted by Stuart Herbert on April 14th, 2010 in A470 Trunk Road, Glamorganshire Canal, Manufacturing, Modern, Photos, Pontypridd, Shoot. I recently went over to the site where the Newbridge Chainworks operated by Brown Lenox and Co, Ltd, once stood. The site is reached by a bit of a torturous route if you’re going to stick to public footpaths; one has to walk round to Pontypridd Railway Station, and then round the outside of Ynysangharad Park and cross the sliproad that goes down to the A470. And then you have to go all the way back afterwards. I’m assuming that they’ll do something to improve this if they build a supermarket on the site. 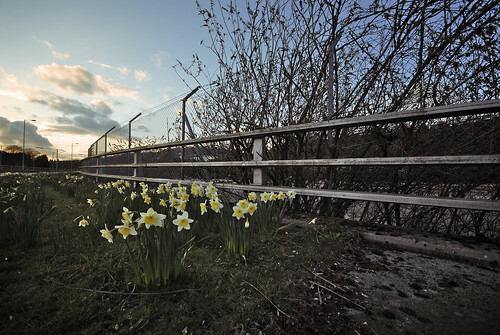 But, whilst I was there, I couldn’t help but notice this wonderful spread of daffodils growing beside the road. The setting sun meant that the light was against me (I’d already used the best of the light to take some snaps of Unity, which I’ll upload soon), but I like the gritty look that the conditions ultimately gave this photo. Posted by Stuart Herbert on April 12th, 2010 in A4054 (Merthyr Road), A470 Trunk Road, Glamorganshire Canal, Historical, Manufacturing, Photos, Pontypridd, Shoot. This is the site where the Newbridge Chain Works, operated by Brown, Lenox, and Co Ltd used to be. The Chain Works were built in 1816, and Brown Lennox operated a factory here until 2000. Since then, the site fell into disrepair, until in 2007 the local council took steps which eventually led to the site being cleared in 2009. The Rhondda Cynon Taff Libraries Digital Archive contains over fifty photos of the chainworks, several of which have been published in local history books over the years. Today, the town is waiting to hear what will happen next on this piece of prime land … one of the oldest pieces of developed land in the town. 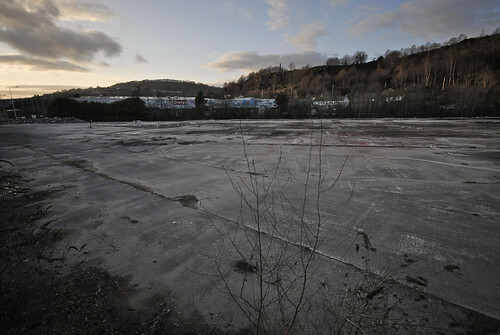 Originally it was going to be a Morrisons supermarket, but that was rejected by the Welsh Assembly Government. Now? It might become a Sainsbury’s supermarket instead. Or maybe in 10 years time we’ll still be left wondering what will happen. Posted by Stuart Herbert on April 5th, 2010 in A470 Trunk Road, Coal, Manufacturing, Modern, Photos, Pontypridd, Pontypridd, Caerphilly and Newport Railway, River Taff, Shoot, Taff Vale Railway (Modern-day Valley Lines). 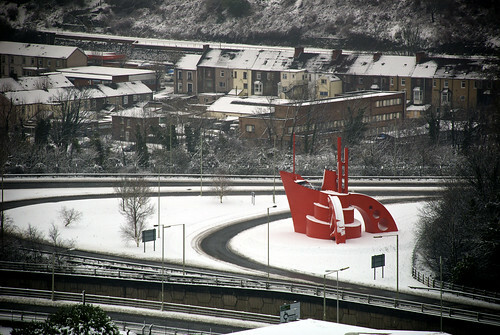 After the Brown Lennox site was cleared in 2009, this bright red sculpture appeared opposite, just outside the southern end of the Ynysangharad Park. It incorporates the Titanic (the chains for the Titanic were made at Brown Lennox), the old bridge that gives Pontypridd its name (which still stands today), and the flywheel from a mine lift (none of the mines have survived through to today). It’s nice to see the much-maligned RCT making an effort in Pontypridd for a change, but like so much of what they do it just misses the mark. Why? Because if you’re coming north from Cardiff on the A470, this sculpture is mostly hidden from view by the turnoff into Pontypridd itself. Contrast that to other roadside art installations around the UK, such as the Angel of the North, which are sited specifically to be seen by approaching drivers. I’m sure this thing must have an official name 🙂 If anyone knows what it is, please leave a comment below. It sits close to the now-lost route of the Pontypridd, Caerphilly and Newport Railway, and opposite the site where the Brown Lennox factory used to stand. In the background runs the line of the old Taff Vale Railway (TVR), today the main passenger line up and down the valleys. The road curving up and to the right crosses the River Taff. Posted by Stuart Herbert on March 11th, 2010 in Cardiff, Manufacturing, Modern, Photos, River Taff, Shoot. This is a view across the River Taff that I get to enjoy several mornings a week; steam rising from the Brains Brewery just outside Cardiff Central railway station. Posted by Stuart Herbert on June 2nd, 2007 in A470 Trunk Road, Barry Railway, Cardiff, Church Village, Egwlysilan, Gwaelod-y-Garth, Historical, Iron & Steel, Manufacturing, Melingriffith, Modern, Nantgarw, Quarrying, Shoot, Taff Vale Railway (Modern-day Valley Lines), Taffs Well, Tin Works, Walking Routes. Enjoy The View From The Garth as part of my Merthyr Road series on Flickr. If there’s one part of the landscape that dominates views of both Taff Vale and Cardiff, it has to be the Garth. But what can you see from up on the Garth? That’s what I went up there to find out. The day was a tale of two directions. To the south, towards the Vale of Glamorgan and Cardiff, conditions were very difficult for landscape photography, with the sun reflecting off the Bristol Channel beyond the South Wales coastline. The photos shot facing that way all suffered from limited contrast and colour; I ended up converting those to black and white to make the most of them. To the east, towards Caerphilly and Taffs Well, the light was much better (well, in between the rain drops 🙂 ). I was able to get nice, crisp shots of most of my subjects, and I was able to leave those photos in colour. 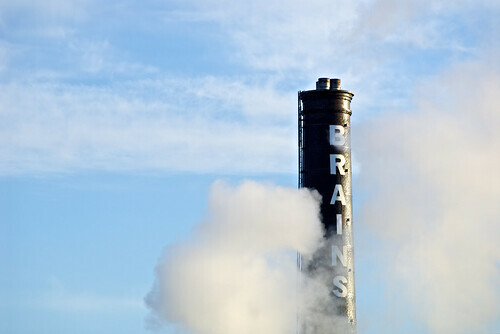 This photo of the General Electric plant at Nantgarw is my favourite photo from this shoot. Being up on the Garth provided the perfect elevation to show how GE’s factory dominates the entire hill side and the communities that it surrounds. I also like the photo of the War Memorial (simply because it’s a great demonstration how just how much reach the Sigma 80-400 mm lens has) and my shot of the Millennium Stadium in the heart of Cardiff (because it shows just how central the stadium is). Now, getting the final panoramic shot uploaded to Flickr … that was far harder than generating the shot in the first place! This old postcard provides a great view of the Walnut Tree Viaduct with the Garth beyond it. With a lot more care and thought into how the heritage of the South Wales valleys could be protected and developed, this could have been the view that greeted visitors leaving the M4 bound for the Brecon Beacons. I think it’s a shame that it isn’t so. Posted by Stuart Herbert on May 4th, 2007 in A470 Trunk Road, Cardiff Railway, Manufacturing, Merthyr Road, Modern, Photos, Rhymney Railway, Taffs Well. The start of something a bit different, this week. When I’m out photographing the (normally historic) subjects and routes for my Merthyr Road project, I’m always coming across sights that appeal to me as a photographer, but which don’t really fit in all that well with the photos I choose for the final article published here on my blog. Rather than lose these photos, I’ve decided to give each shot its very own article. 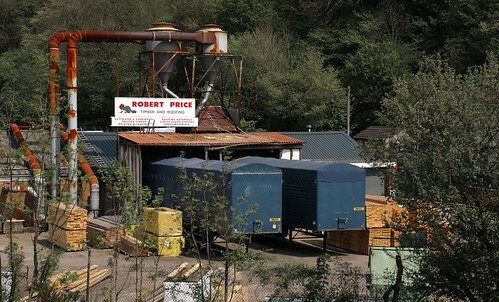 First up is this shot of Robert Price Timber and Roofing in Taffs Well. 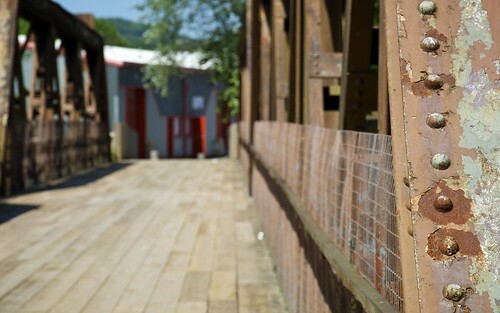 Their timber yard is bounded on the east by the A470 trunk road, and on the south by the former Rhymney Valley Railway line from Walnut Tree Junction (the line now forms part of the Taff Trail cycle route). Something (maybe a tramroad or railway) used to run north to south through the ground where their yard now stands. There’s a surviving bridge that the former Rhymney Valley Railway line crosses on the south side of the timber yard, and hunting through the trees to the north of the timber yard, there’s the remains of something that looks like it could have been a bridge support. UPDATE: the something is the remains of the Cardiff Railway route from Tongwynlais to Rhydefelin Halt. Posted by Stuart Herbert on March 22nd, 2007 in A470 Trunk Road, Glamorganshire Canal, Historical, Manufacturing, Merthyr Road, Pontypridd, Shoot. My quest to explore the route once taken by the old Glamorganshire Canal recently led me to a surviving stretch of canal hidden in the shadow of the A4054 as it passes from Glyntaff to Coedpenmaen in Pontypridd. Here canal boats used to load chains made at the Brown, Lenox & Co. Ltd. factory in Newbridge. It was Samuel Brown (the Brown in Brown, Lenox & Co. Ltd) who patented iron chains for securing ships to their anchors (replacing ropes), and with his cousin Samuel Lenox he established a highly successful company to manufacture these chains. Brown and Lenox built their first factory in Millwall, on the River Thames, but increased demand led to them constructing a second factory (the Newbridge Chain Works) on the west bank of the Glamorganshire Canal in 1816. Found on the Rhondda Cynon Taff district council’s website, this photo provides a great view of how the canal basin at Brown Lenox looked in years gone by. The bridge that still survives today can be seen just below the canal lock. The second bridge into the Brown Lenox loading dock no longer survives. I’ve used the bridge at the northern end of the Brown Lenox basin many times as a cut through from Ynysangharad Road to the Brown Lenox Retail Park, but I never remembered seeing the canal basin itself there before. How could I have missed it? In truth, there’s hardly anything left of the canal at this stretch – especially when you look at old photos like the one above. 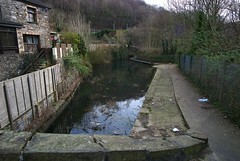 The canal has been completely filled in to the north of the bridge, and after less than fifty yards to the south the basin begins to narrow where the path has been moved to make way for the factory’s car park. Although today’s footpath is cement or tarmac its entire length, the path is surprisingly muddy in several places. As you head south, the basin quickly disappears. The footpath ends up roughly where the east bank of the canal once stood, as the path squeezes past the shadow of the abandoned Brown Lenox factory. I walked the path south to its end and then back north; by the time I came past Brown Lenox for the second time, the path was obstructed with wooden palettes apparently being lifted from the Brown Lenox site! Past Brown Lenox, the footpath crosses an ugly little bridge, and joins up with the old towpath once more. This stretch of the canal is quite a bit longer than the Brown Lenox basin, running past some cottages on the west bank before disappearing once more under modern concrete and cement. To the best of my knowledge, the canal doesn’t re-appear again until the pottery at Nantgarw, and can’t be walked along once more until Tongwynlais (see my earlier posting on that surviving section). All the surviving sections of the canal that I’ve found so far all survive for three reasons. Firstly, and most importantly, they haven’t disappeared under the A470 trunk road; secondly, they haven’t disappeared under post-war housing estates or shopping (which is what happened to the canal from Melingriffith southwards), and thirdly, they’re south of Pontypridd. This section hasn’t disappeared under the A470 because the A470 goes around the other side of the Brown Lenox factory. I took some photos on this shoot which show just how close the A470 is, and that the line of the canal south disappears under the A470 at Glyntaff. When Lord Bute finally bought the canal, he originally wanted to close it and use the route for a railway line. He ended up being forced to make a go of the canal against his wishes. Today, much of the route of the canal has been taken by the A470 … just has road has replaced rail as the main form of transport in the UK. I wonder what will replace the A470 in a hundred year’s time? Pontypridd sits in a bowl, surrounded by hills and mountains on all sides. The A470 squeezes through a narrow gap between the River Taff and the Brown Lenox site as it heads down to Treforrest. Between the three of them, they left no room for anyone to build over the canal with housing or shopping. However, standing on the surviving canal bridge, you can immediately see that this wasn’t the case to the north, where the canal, the locks and Canal Bridge have all disappeared under the Brown Lenox Retail Park and the A470 to its immediate north. The future of the Brown Lenox site isn’t clear. At least one out-of-town supermarket chain wanted to buy the site to use for a new store, but that appears to have fallen through. Whatever happens to the site, there’ll always be the threat that some modern development will seek to erase this section of the canal. If that happens, that’ll leave the section at Tongwynlais as the most northern surviving section of the Canal. The canal north of Pontypridd fell into disuse in 1915, and north of Abercynon it fell into disuse in 1898 I understand. When you walk the Taff Trail up to Merthyr Tydfil, what strikes me is that, although the canal has been filled in, it isn’t as if the land has been reclaimed for any other use until you get into Merthyr itself. It makes me wonder whether the canal was filled in by human effort, or whether it just silted up and was eventually reclaimed by Mother Nature. (I suspect the truth is a little of both). I’m spoilt for choice from this shoot. I really like this quirky shot of the footpath behind the abandoned Brown Lenox factory. It’s an unusual shot, and one that seems to have a bit of energy to it. I also love this shot of the row of cottages at the southern end of this surviving stretch of canal, and this shot of the canal basin hidden behind Brown Lenox, and this shot looking north towards Brown Lenox from beside the surviving towpath. But my favourite is this shot of the bridge and Ynysangharad Road beyond, taken from just inside the Brown Lenox site. Whilst taking the shot, I got chatting to a lovely old couple who could remember times when the canal was still in use. I really hope they’re successful in their work to have the War Memorial up on Coedpenmaen Common floodlit on an evening. That’ll make for a spectacular sight indeed. Take your time and say ‘Hi’ to the folks you meet. It really made my day chatting with the old couple who could remember back when the canal was still in use – and could recall when Canal Bridge just to the north still existed, before being lost under the A470. Coverage (again)! When I got to the southern end of the path, I stopped. Grrr. I wish I’d gone further and taken some shots of the path beside the motorbike shop. Although I don’t live far from here, I’ll have to wait until the weekend for enough daylight to get the extra shots in the bag. Shock, horror – colour photos from me for a change! All of these photos look gorgeous in black and white (I always convert photos to monochrome in Aperture to adjust contrast and levels) but I really like the colours captured in the photos, such as this one of the cottages between the canal and the A470. I’ve started shooting using the AdobeRGB colour space, and mode colour mode II on the D200. It’s a much more neutral combination than sRGB + colour mode III (my choice throughout my time with the D100, and carried over to the D200 for the first year), and it’s often recommended online as being the best choice for post processing. With a little bit of green and blue boosting for landscapes, or red boosting for industrial ruins, I can see how the result is easier on the eye.